I’ve been having great fun critiquing five new-ish YA authors as part of C1Blitz 2015, a fantastic competition I recently entered – check out Freshly Squeezed Reads’ website (if you haven’t entered, you can now read the first lines of each entry; and then read the whole first chapters if you sign in for free with WordPress). I entered the first chapter of my YA novel, Facing Up, and so far the two teen readers who critiqued it on a live panel as part of the recent Digital Writers’ Festival appeared to love it, so I’m just rapt about that for a start! Grab the reader’s attention with the first line. Don’t start with a long description of the main character or where they live – come in halfway through the action, as it were. This is called in medias res – I learnt that phrase from Fergus, a 13 year old teen reviewer in the above-mentioned live panel! Provide enough information about the main character to interest the reader and make them care about that character, without giving it all away. Hint at the conflict the character will face, without giving it all away. Maintain a good pace – it doesn’t need to be breakneck action, but just keep the reader interested enough to keep going. So, got all that? It’s just so easy, isn’t it! One of the best suggestions I read (by Sarah Schauerte) was to finish writing the entire first draft of your novel, then go back and re-write the first chapter to make sure it reflects what happens in the story. That way you can remove any extraneous storytelling and descriptions and really make that first chapter take the reader on a ride he/she doesn’t want to get off! 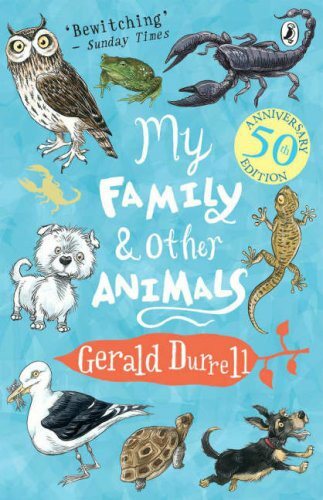 Recently I re-read the start of one of my all-time favourite books, Gerald Durrell’s My Family and Other Animals (click on this link to read the first chapter via Amazon). His title is quirky and cheeky, and the start of his first chapter, while seemingly an innocuous scene from a loungeroom in cold old England, circa 1935, sets up his wonderfully odd family to perfection. He even manages to get away with a list of luggage for each family member that reflects each of their characters. For any other writer, I would have said better to come in halfway through one of his crazy adventures, collecting an army of exotic pets around him while living on the Greek island of Corfu as a ten year old, but in this case his first chapter perfectly reflects the title of the book, and explains how the entire family just picked up and left England almost on a whim. Well, that’s an adventure in itself! So, what are some first lines/first chapters that have stood out for you, and why? This entry was posted in Writing, Young Adult book and tagged Ch1Blitz 2015, Chapter 1, Editing, Freshly Squeezed Reads, Gerald Durrell, My Family and Other Animals, teenagers, Writing, Writing first chapters, YA novel. Bookmark the permalink. Hmm…first chapters or lines? One of my guilty reading pleasures – the Shopaholic series – always starts with Becky, the main character, telling herself “Don’t panic” with regard to something. In the first book, it’s her credit card bill. (In related news, I think that the reason I loved these books from Day One had something to do with my ability to relate to Becky…). I have no idea where it could have come from! I’ve just seen Choppy’s pink outfit with the high heels – have you thought of therapy for her? However, since I thought she pulled off the costume rather well, perhaps I need therapy!